Slow cooker beef brisket recipe | Health Stand Nutrition Consulting Inc. The savoury aroma of this simmering slow cooker beef recipe traveling throughout the house will leave your dinner party guests excited for what is to come! This recipe is perfect for a Christmas feast, dinner party, or New Year’s Eve shaker! This post is sponsored by my client Gemstone Grass Fed Beef. As a dietitan mom, I love that this product is locally raised and produced, and since I have met the family producing this grass-fed beef, I buy and support Gemstone for our family meals. Give it a try! 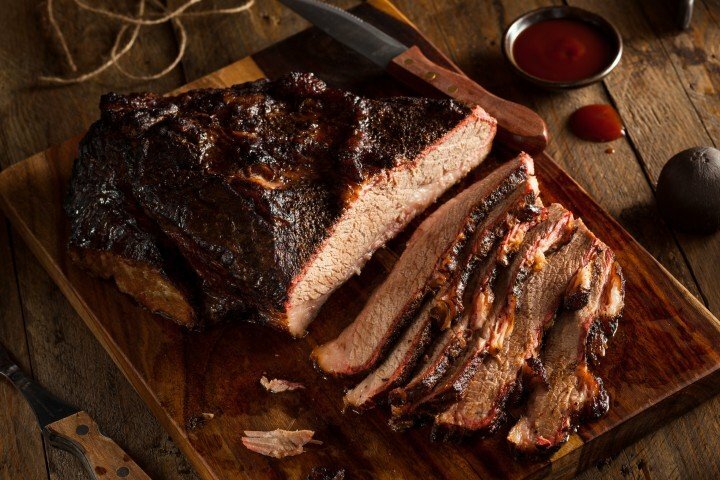 Visit their online store to order your brisket – included in their Beef Smoker Box! For the month of December, Gemstone Grass Fed Beef is offering 15% off their Beef Staples Box and their Beef Smoker Box! Use promo codes: HEALTHSTAND-SMOKER15 & HEALTHSTAND-STAPLE15 at checkout. Mix dry spices together and rub over the lean side of the brisket. Sprinkle liquid smoke over the spices. Tightly wrap the meat in plastic wrap and refrigerate overnight. In the morning place the brisket in the slow cooker fat side to the bottom. Mix all sauce ingredients together and pour over meat. Cook on high for 6 hours. Once cooked, remove the meat to cutting board, and rest before cutting. Take pan juices from the slow cooker and place in a saucepan. Cook for 10 minutes at a low bubble until reduced by 1/3 to 1/2. Serve sauce with sliced brisket. For the month of December 2018 Gemstone Grass Fed Beef is offering 15% off their Beef Staples Box and their Beef Smoker Box! Use promo codes: HEALTHSTAND-SMOKER15 & HEALTHSTAND-STAPLE15 at checkout.